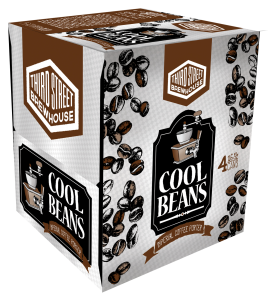 COLD SPRING, MN – Third Street Brewhouse (Third Street), is pleased to announce the release of their specialty brew, Cool Beans Imperial Coffee Porter. Cool Beans is a rich, malty porter brewed with Sumatra beans from Muggsy’s Beans, a local roaster in St. Cloud, MN. Cool Beans Imperial Coffee Porter is a flavorful brew, and pairs nicely with bold flavored comfort foods like roasted or smoked meats including barbecue, sausages or blackened fish. It also holds its own after dinner, and goes nicely with chocolate, peanut butter or coconut flavored desserts. The specialty launch also introduces the Coffee Porter’s new can and packaging design – just in time for the New Year! The new look captures the dark brown colors and flavors of rich chocolate and Sumatra beans, to create a look as bold as the brew itself. Along with its specialty and seasonal ales, Third Street has four popular signature brews on tap and in cans: Minnesota Gold, Minnesota Gold Light, Hop Lift, 3 Way and Lost Trout. Third Street Brewhouse craft beers are available for purchase in liquor stores throughout the state, and can be found on tap in many local bars and restaurants. Third Street’s tap house is open on Fridays from 4-8pm and Saturdays from 12-5pm. Visit Third Street’s website at www.thirdstreetbrewhouse.com for additional information, locations and a full list of beers.